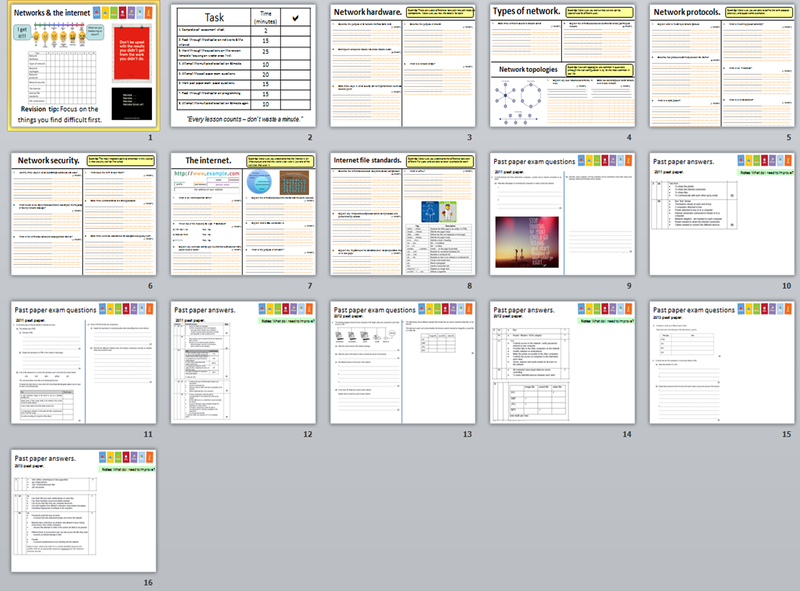 Increasing bandwidth – Planning a revision session. Talent isn’t born. It’s made. ‘The Talent Code’ by Daniel Coyle. Ignition or primal cues relates to the motivation a person has to be successful in the first place. As a teacher I believe it’s part of my job to talk to students about what motivates them to succeed. Some students are able to easily articulate this. whereas some will need some help finding the reason why they need to be successful. Either way I need to support the students I teach in understanding their ignition to succeed. 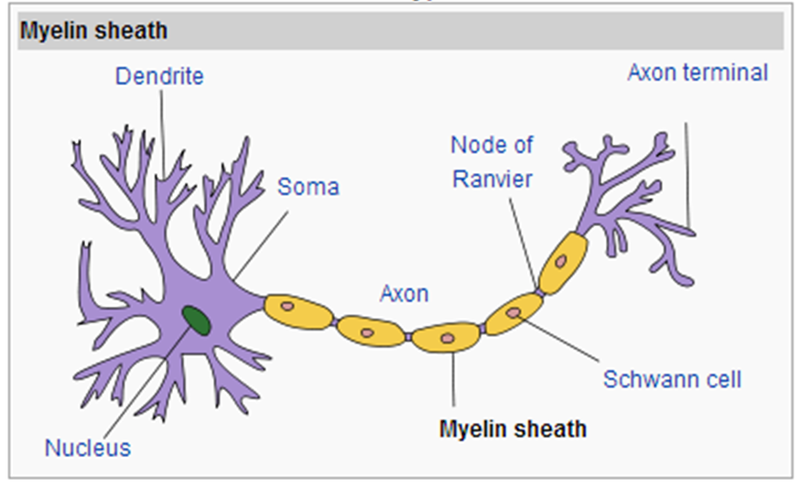 Myelin is a lipid and protein sheath-like material that forms an insulating cover that surrounds and protects nerve fibres. The general idea is that the more myelin you have insulating your nerve fibres, the faster impulses (or information) can travel between nerve cells. Some scientists believe that myelin can be increased with regular deliberate practice. It’s similar to bandwidth in the speed of an internet connection. The more bandwidth you have the faster the transfer of data. 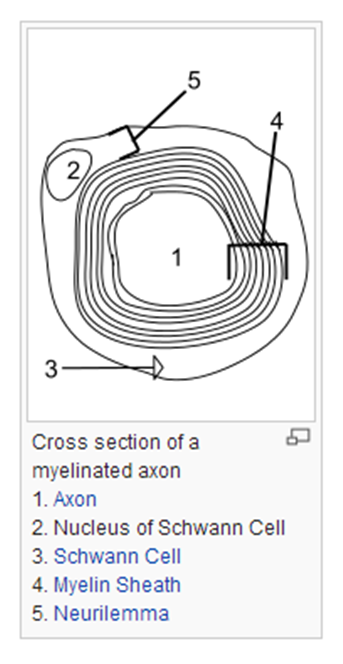 The more practice you put in, the more the myelin wraps around the nerve fibre increasing the bandwidth (the diagram below shows this in a bit more detail). It’s worth noting that this works both ways and needs to be maintained with regular practice. Daniel Coyle uses the example of Brazilian soccer players to explain deep practice in action. From an early age they play a game called Futsal and they continue to play it into their teenage years. Futsal is played on smaller court with a smaller ball which means that players will touch the ball more often than playing 11 a side on a full size pitch. This is deep practice. It’s quality controlled by a master coach (someone with expert knowledge of the game / subject) who intervenes with striking impact to ensure learning is meaningful. 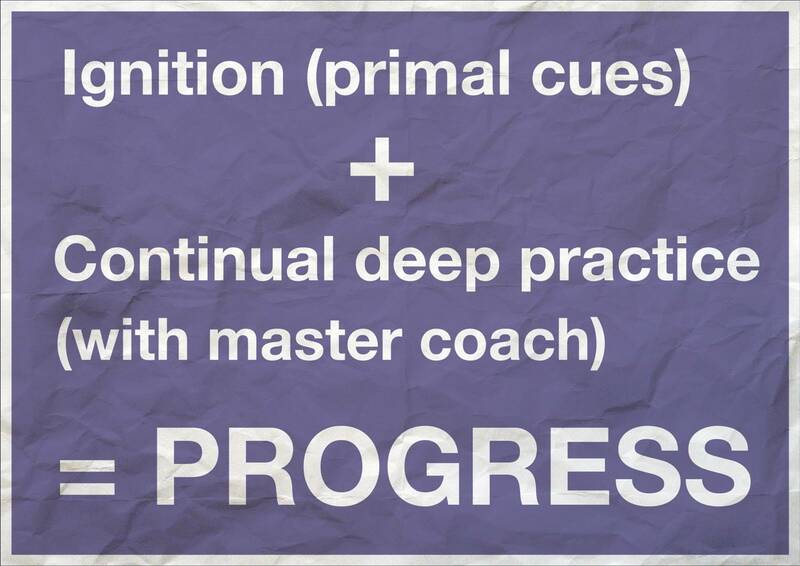 The video below examines more examples of where deep practice has produced successful outcomes. How does this apply to revision? If we want students to be successful in exams then they need to practice – sounds simple enough, but is not entirely true. If we want students to be successful they have to fine tune their practice so that it is deep, deliberate and regular in order to build up a thicker insulation of myelin. What follows are few strategies that I am currently trialling to achieve this. 1) Regular self assessment with input from the teacher. It’s important to let students assess their own strengths and weaknesses when it comes to a topic to revise. Teachers are the master coaches described in ‘The Talent Code.’ We have to know our students well and track their learning and use this information to intervene with self assessments so that students know what they are actually good at and areas that they need to improve. The key to good revision (I believe) is to focus more time on the weaker areas (being deliberate) rather than spending lots of time revisiting knowledge/skills that a student is already competent in. Below is an example of a self-assessment I have used with students. The black ‘X’ represents the student response. The green Y’s represent my response based upon prior testing and my knowledge of the students competencies through questioning and classwork. If I have agreed with the students response I have not added an additional symbol. 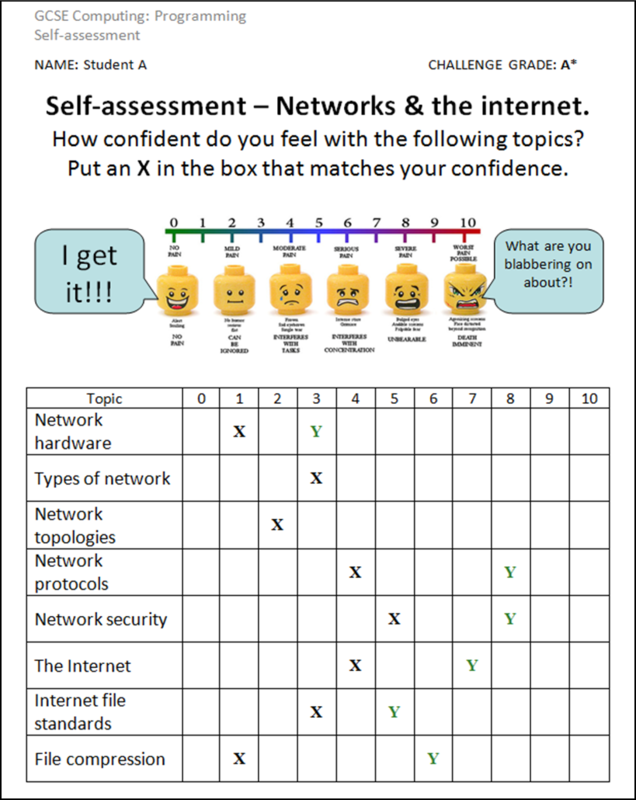 Self-assessment grid example – used prior to starting revision for a particular topic. The grid provides a clarity. Students get validation for what they think they already know or an opportunity to discuss area for improvements. It also helps students to focus in on the weaker areas and thus provides a starting point for revision. Once students have self assessed their strengths and weaknesses and they have been agreed, they can then begin revising required knowledge. In order to not overload the students working memory I have created a resource that chunks the information down in smaller sub-topics (see the list on the self reflection diagram above). Each sub topic has a series of questions that students answer in an open book environment. Example answers to these sections are released to students once they have attempted to answer them. They also have access to past paper exam questions and answers. Students are free to work through this revision pack using the self assessment as a rudder to guide them towards topics that will require more attention. Example revision pack split into sub topics with past paper exam questions. 3) Regular rigorous multiple choice tests. The ‘chunked’ revision materials are sync with a multiple choice test. 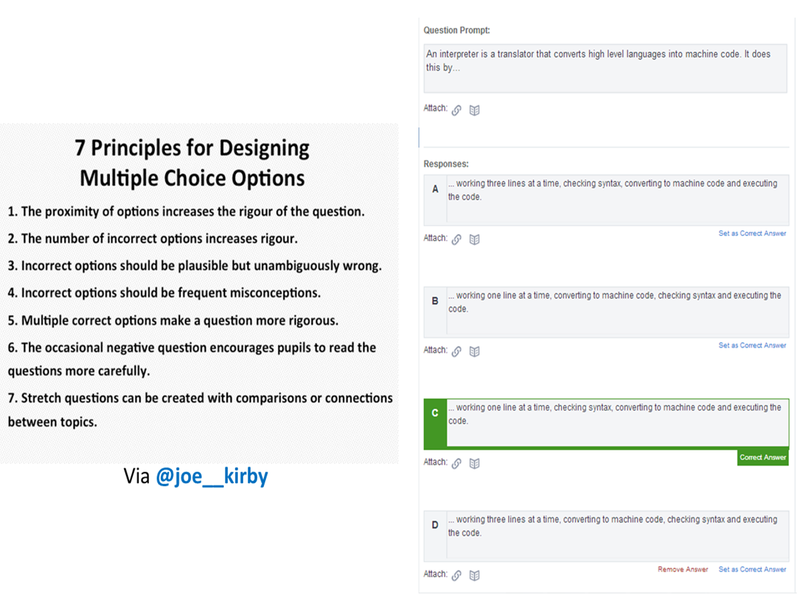 I have created the tests using Joe Kirby’s brilliant posts on designing rigorous multiple choice tests (Post 1 | Post 2). I’ve attempted to increase rigor by adding more incorrect answers that are based on common student misconceptions. Example question from a multiple choice test for GCSE Computing. The tests can be taken multiple times and using a platform like Edmodo means the tests are also tracked and scored without the teacher lifting a finger. 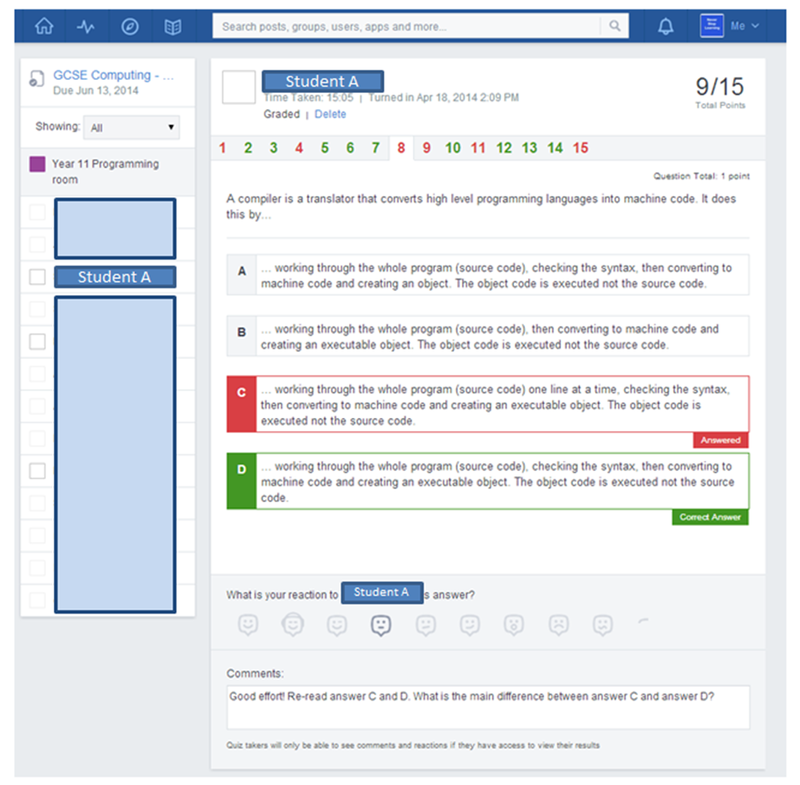 Edmodo also allows students to go back through the test and see where they dropped marks. An example of automatic feedback generated by Edmodo coupled with a comment from the teacher. Repeated retrieval improves long term retention: frequent quizzing prevents forgetting. Read more about this here at Joe’s blog. 4) Regular ‘Walking – Talking’ mock exams. One new strategy that has been trialled at my school this year has been ‘walking-talking’ mocks in all subjects. For those not familiar here’s how they work. The students revise for a mock as normal. When the mock exam takes place the teacher walks them through the first question and then gives students an appropriate amount of time (depending on the number of marks available usually) to complete the question and then get some instant feedback on how well they did. It’s hard to judge the real impact of doing this exercise but it certainly helps students feel more comfortable in exam conditions. I know I have been guilty in the past of running a mock exam in ‘exam conditions’, students tend to score poorly on it, get feedback but didn’t get an opportunity to re-draft answers (my fault) and the whole scenario was demotivating and not very productive. A walking-talking mock provide students to feel success in an exam environment. This new found motivation can then be used to drive revision sessions. As the year goes the strategy is to get students to sit 3-4 mock exams and by the end of the process provide them with less and less support as their confidence grows. This post is by no means a ‘you should run revision sessions like this’ post. It’s a reflection on some of the ideas that have inspired my thoughts around how to do revision better. It is very much a work in progress and feedback is very much welcome! I often tell my students to not be upset with the results they didn’t get from the work they didn’t do. I feel the same and care deeply about their results. When my students walk into the their exam I want to make sure I’ve done everything within my power to ensure they succeed. *I am not a scientist. For more information on myelin please see this interactive guide or even better still, read Daniel Coyle’s book ‘The Talent Code. 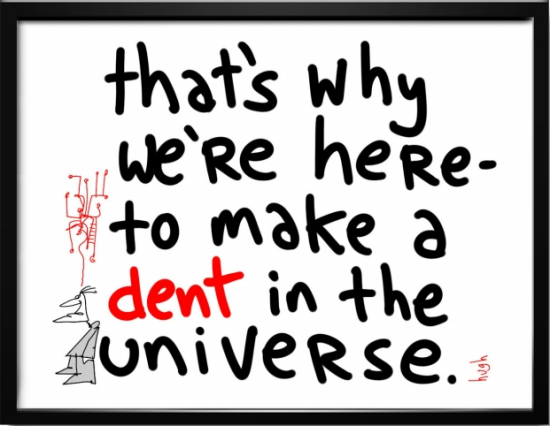 Inspired by Zoe Elder’s post – ‘Why we continue to accept the challenge’ and Mark Anderson’s post ‘Be happy,’ here is a quick post with the start of a new term in mind. 2013 was a remarkable year. 2014 will be better. It’s time to shift gears. Remember, you’re only human but you make an incredible difference. Our lives are a string of experiences. Experiences with people and experiences with things. And we, as designers — as the people who craft experiences — we have a profound responsibility to make every experience as beautiful, as comfortable, as painless, as empowering, and as delightful as possible. Now read the quote again but replace the word ‘designers’ with ‘teachers.’ Perhaps as teachers we have a duty to make students uncomfortable and allow them to struggle in order to learn, but the rest of the quote really rings true with me. As teachers we have to recognise that every interaction we have with young people is an opportunity to have a positive impact upon them. Teachers are artists and lessons are our art. Being passionate about our subjects mixed with a continued desire to improve and develop our pedagogy is key to providing the ‘Superman effect’ for our students. How can we make students feel like super hero’s in our lessons? We need to make them feel more excited about entering our classrooms rather than leaving them. Next time you’re planning a lesson consider the ‘user experience’ and make it remarkable. In Aral’s extended version of his talk (see below) he also talks about how design gets compromised when companies have misguided CEO’s who seek to dictate the journey to success and quite often get it wrong. How true is this in schools? How many times have SLT implemented policies / procedures with little or no consultation from staff (thankfully this doesn’t happen in my school, but I’m sure we’ve all heard a horror story in our time…)? The way to unleash potential is to ensure that leadership is distributed across the school and that power is dissolved to all staff. Let the people who are closet to the action have a say in the critical decisions, empower them to lead. Aral Balkan: Superheroes & Villains in Design from Thinking Digital on Vimeo. Seth Godin talks about being remarkable in his book ‘Purple Cow.’ He talks about truly remarkable products / ideas and people or as he calls them ‘Purple cows.’ I believe teachers have a responsibility to be remarkable and provide remarkable experiences for their students. ‘Good enough’ or ‘that’ll do’ or even ‘Very good’ is a one ticket to mediocrity. It’s not remarkable. You are an artist with talent waiting to be unleashed. Be creative. Safe is risky. Don’t be boring. Be remarkable in everything you do.